Please email Mike Brogden to add to this list. Gwendoline Brogden (born in Hull 1891; died 1973) (click here for photo provided by Peter Dutton) was a musical comedy and light-opera soprano and a talented pupil at Madame Sharrer's Hull School of Music. At one of the Sharrer pupils' concerts, on 9.11.1911, Gwen received a basket of flowers on the handle of which dangled a gold watch. 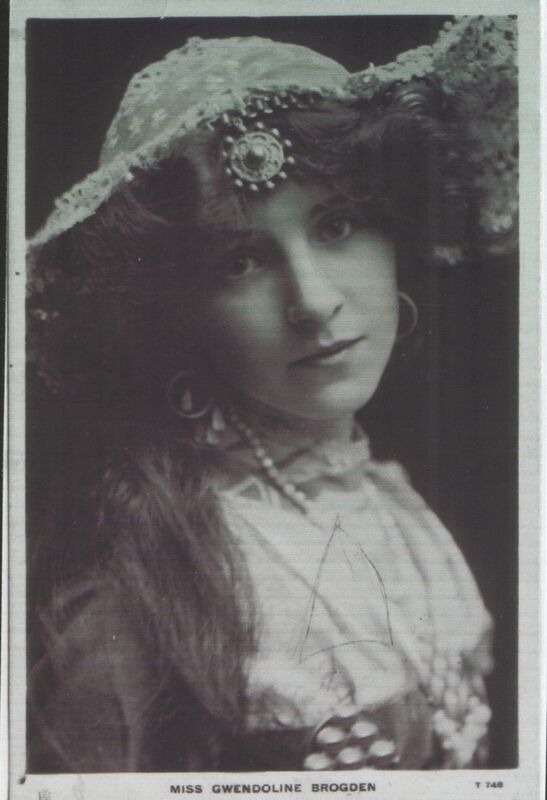 The HDM [Hull Daily Mail] (20.11.1911) described her as "simple and winsome in her song 'Yesterday and Tomorrow'". She was sponsored by the Wilsons of Tranby Croft and later worked mainly at the Gaiety Theatre in London and recorded for HMV. Her father was Thomas Brogden (c.1854 to c.1931) headmaster for forty-two years of St. Charles' Catholic Boys' School in Pryme Street, and choirmaster of St. Charles' Church when Fawcett was the organist - certainly in 1891 and 1898, according to The Hull Critic, and in 1911, acording to the HDM. Born: 28.09.1891, mother Gertrude (nee Walsh). Gwen or Gwennie sometimes acted and sang with Annie Croft, another Wilson protegee. Mary Wilson paid for Gwen's London debut. Married Basil Samuel Foster and had one daughter, Mary Gwendoline and her (Gwen Brogden's) second marriage was in 1937 to Sir Dudley Forwood, equerry to the Duke of Windsor at abdication time. 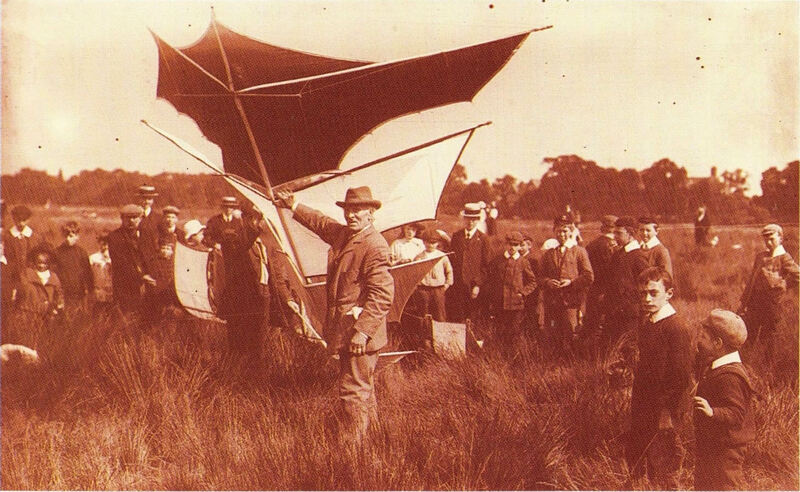 Later married Percy Waterman Pitt (was he Percy Pitt the conductor who worked with Beecham?) and died at Sunningdale Nursing Home 6.4.1973. Mary married four times. Three recordings of Gwendoline performing were issued by HMV (eg HMV B519). "I remember Gwendoline with great fondness as a close friend of my grandmother Countess Beauchamp and my step-grandfather Earl Beauchamp of Madresfield Court, Malvern. She and her husband, whom we only knew as Boo Pitt, were regular visitors in the 60s, and always at Christmas. After dinner she was always persuaded to play the piano and sing, mostly Noel Coward numbers, as I recall. I don't know how they met, but very likely on a cruise, where my grandparents befriended many people. Boo and Gwinny were both absolutely charming, and totally devoted to each other. 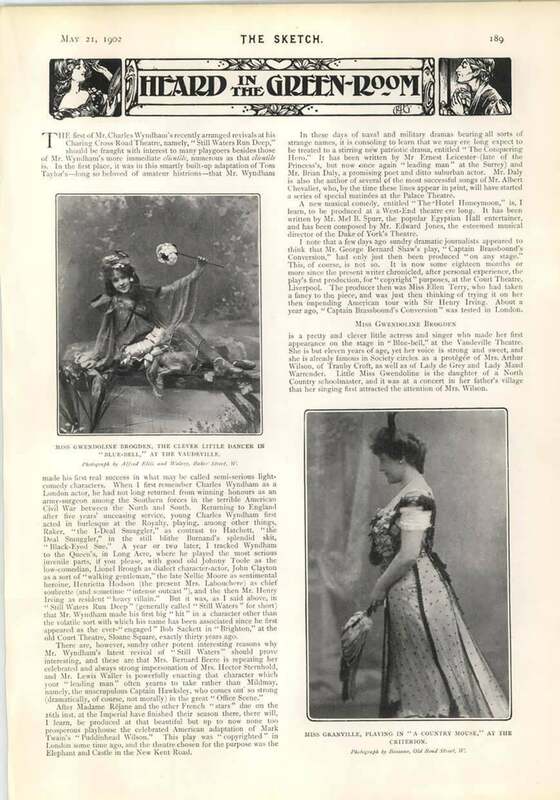 Although we understood she had been a music hall star, I knew nothing of her career until I read the piece on her. As kids, a fascination for us was his glass eye, reportedly the result of some childhood prank gone wrong. We always understood Boo was a businessman of come kind. Certainly no musician as far as I could tell. I recall a summer holiday with them in Venice in 1968 at the time of the Prague uprising. We heard she had died in a nursing home, and it is good to have read about her." Photograph kindly provided by Peter Dutton. Further information from Gwendoline's great grandson, Paddy Forwood and JPN Brogden's daughter, Teresa Deasy. Many thanks to all correspondents. Arthur Ernest Brogden was born in Merthyr Tydfill 11 August 1883, probably in theatrical digs whilst his mother (Ada, formerly Lebutt, a singer) and father Joseph (but known as Arthur) were on tour with the Swiss Choir. Arthur Ernest became a violinist and married Rachel Morgan in Durham in 1904. 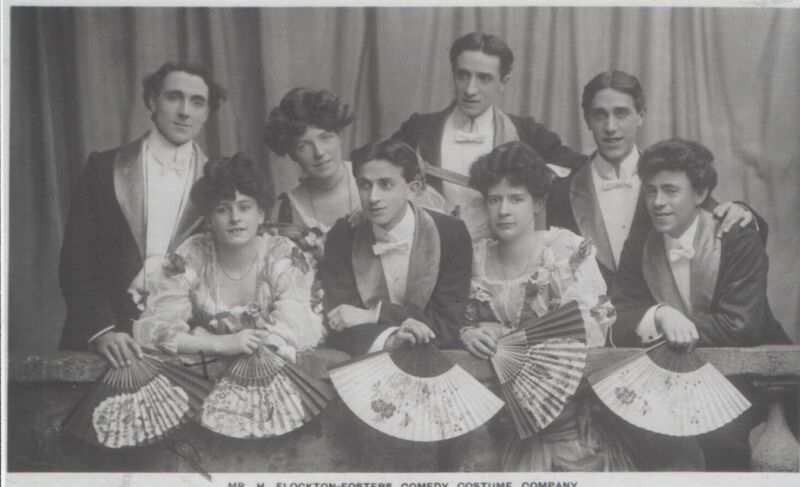 They both joined Mr H Flockson-Foster's comedy costume company (Click here for photo) (Arthur Ernest is at middle back and Rachel is front left.) They toured northern seaside towns during the summer. They had two children, Arthur Owen born 1905 (who became a bank clerk) and Ernest (no information) but separated and Rachel went to live with her parents. The British Embassy in Recoleta, Argentina, has an eighteenth century grandfather clock in mahogany made by James Brogden. Presumably, this is the same James Brogden of Aldersgate Street. He also appears in Kent's Directory of 1794 as a watchmaker. 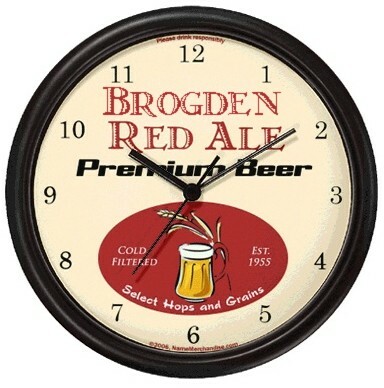 Brogden and Garland, watch and clockmakers, London; founded by John Brogden (the elder) in about 1796, becoming Brogden and Garland in 1824 to 1831 and Garland and Watherston from 1831 - 1841. John Brogden (junior) was apprenticed here and became a partner in 1831. From 1842 - 1864, on the departure of Garland, the firm became Watherston and Brogden, moving to new premises at 16 Henrietta Street, Covent Garden, London. They exhibited jewellery and won prizes at the 1851 Great Exhibition in London. Watherston's had been established in 1798. In 1864, John Brogden took over the premises and operated under his own name until 1880. From 1881 - 1885 he worked as an 'art goldsmith' at Grand Hotel Buildings, Charing Cross. John Brogden's work won prizes, the most notable of which was the gold medal at the 1878 Paris Universal Exhibition. He employed several designers, especially Mrs Charlotte Isabella Newman. A catalogue of over 50 of her designs was sold as part of the "Brogden Archives" at Sotheby's (London) on 5 December 1985. On the death of John Brogden in 1884, Mrs Newman continued as an artist-jeweller, the first woman to do so in London. Birmingham Museum and Art Gallery website where two pendants by John Brogden are illustrated. Updated 8/2009 with information from Sotheby's 1985 sale catalogue. Many thanks to Charlotte Isabella's great grandson, Philip Johnson of Edmonton, Alberta, Canada, for bringing the Brogden website's attention to her work. Philip is hoping to trace the whereabouts of the Brogden Archive. It may be at the V & A Museum, London. Click here for article about Watherston & Brogden, Jewellers. A pendant (complete with its original box) made by John Brogden appeared on the BBC programme, The Antiques Road Show, on 8 October 2006 and was valued at £2000. This item appeared for sale on ebay in 2006. Details not known. Tom Brogden of Warrington was referred to in a UK TV programme in 2004: he built a replica of Hancock's 1832 steam road carriage, "Enterprise." He has also built a replica of the first powered road vehicle - Trevithick's London Steam Carriage. John Brogden and Sons (see articles elsewhere on this website) produced cast iron, including rails for railways, at their enterprises in South Wales in the later 1800s. At the height of their success, this was exported world-wide from their own docks at Porthcawl. The trade marks used on the Brogdens' iron. Advert for Brogden iron and coal. 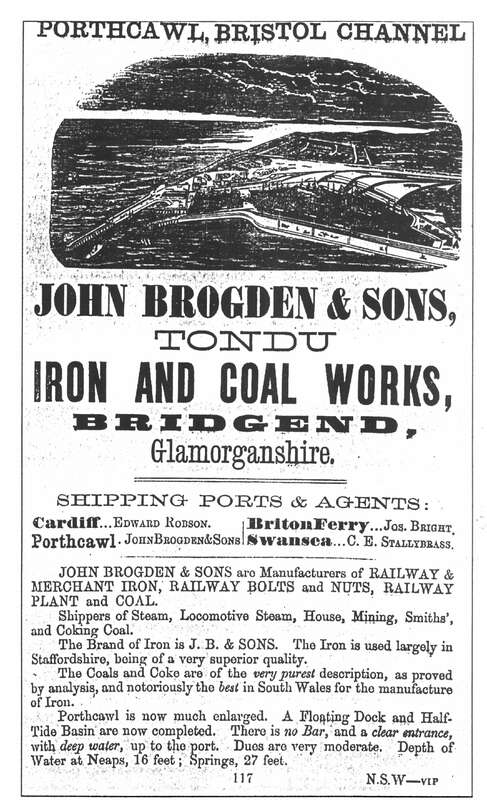 John Brogden and Sons (see Iron above and articles elsewhere on this website) produced coal from their mines in South Wales in the later 1800s. This was exported world-wide from their own docks at Porthcawl until cheaper imports led to the collapse of their enterprises. 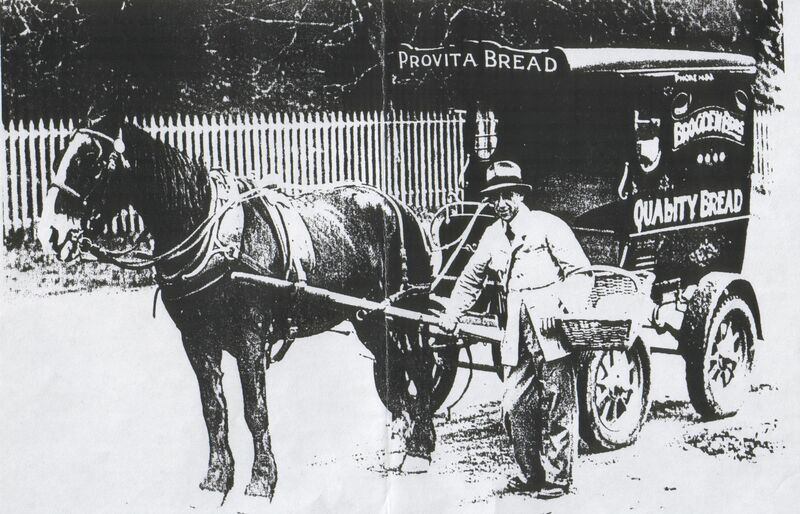 George and John Brogden were bakers in Ballarat, Australia from 1921 to about 1970, delivering with a horse-drawn cart. (Info from Pam and Neil Brogden). 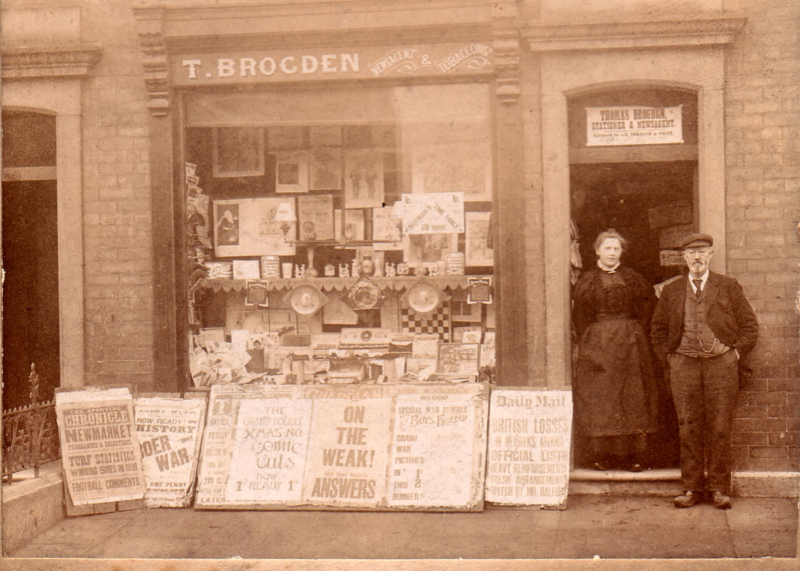 Several Brogdens have run newsagents. One is known in Porthcawl; the details need investigating.